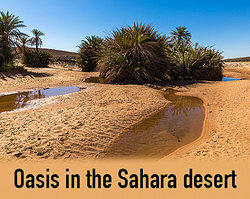 An oasis is a place in a desert that has water supplied by a spring or other underground water source. The word oasis can also be used in a metaphorical way to describe a refuge or relief from something difficult or unpleasant. Al-Hasa oasis region in Saudi Arabia. Mulegé in Baja California Sur, Mexico. San Ignacio in Baja California Sur, Mexico. Al Farafra Oasis is located in the western desert of Egypt. Al Kharga Oasis is located west of the Nile valley. The Bahariya Oasis is the northernmost oasis of Egypt. El Dakhla Oasis is the southernmost oasis in Egypt. Al Fayoum Oasis is located west of the Nile River and south of Cairo. There are many different oases, some are physical and others are metaphorical. Now, you've seen examples of both types. "Oasis Examples." YourDictionary, n.d. Web. 23 April 2019. <https://examples.yourdictionary.com/oasis-examples.html>.